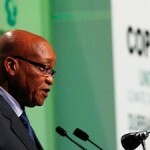 Civils snub Zuma's African agri solution - Climate Justice Now!Climate Justice Now! 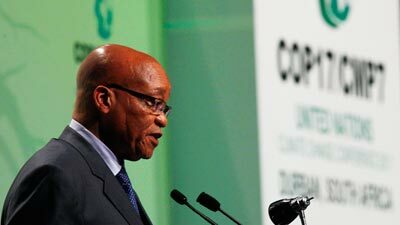 South African President Jacob Zuma’s declaration on “climate smart and carbon markets” as a climate change solution for African agriculture has raised suspicions among roughly 100 civil society organisations at the COP17 conference in Durban. The host nation has been accused of playing against the rest of Africa, “it pretends to be for Africa but it’s not, instead it is toeing the line of worst polluters,” says Teresa Anderson of the Gaia Foundation at Friday’s press conference. A letter signed by African and international civil societies sent to African negotiators at the conference, called for them to reject efforts to place agricultural soils within carbon markets. The agricultural work programme “would lead to agricultural soils and agro-ecological practices being turned into commodities to be sold on carbon markets, or used as sinks to enable industrialised countries to continue to avoid reducing emissions,” the letter says. In a joint statement the Gaia Foundation, African Biodiversity Network (ABN), Institute for Agriculture and Trade Policy (IATP) and EcoNexus, alleges that president Zuma has declared his intention to have a decision on agriculture, while the World Bank is promoting the so called “Climate Smart Agriculture” and carbon offsets as the future of African agriculture and climate solutions. It is suspicious that South Africa is talking agriculture because there have been no discussions on agriculture yet at this conference, Anderson asserts. “An agreement on agriculture at COP 17 would supposedly be as consolation prize to Africa for failure on legally binding targets – but the consolation prize is a poisoned chalice. It will lead to land grabs and deliver African farmers into the hands of fickle carbon markets,” she says. Anne Maina of the ABN says climate smart agriculture comes packaged with carbon offset. “Soil carbon markets could open the door to offset for GM crops and large-scale biochar land grabs, which would be a disaster to Africa. Africa is already suffering from land grab epidemic – the race to control soils for carbon trading could only make this worse”. Biochar involves the burning of woody biomass, usually from trees, to make charcoal for burial in the soil. It is claimed, by the proponents of biochar, that this permanently removes carbon from the atmosphere and sequesters it in the soil. It is also promoted as a major “geo-engineering” solution to global climate change, as well as a means of improving soils and addressing poverty. This entry was posted in Carbon markets, Durban / Negociations, Worldbank out of Climate Campaign and tagged agriculture, Carbon Credits, carbon offsets, climate smart agriculture, Jacob Zuma, South Africa by admin. Bookmark the permalink.